So I was taking my wife and dogs for my birthday walk at Maitland's River Mouth when I came across this adult Sub-Antarctic fur seal lying asleep on the beach. It was obviously very tired as it had a pile of sand building up on its windward side. I wondered if it was dead but after having taken a few photos it suddenly leapt up and barked at me! It looked in good condition and was probably just resting until it takes off again. 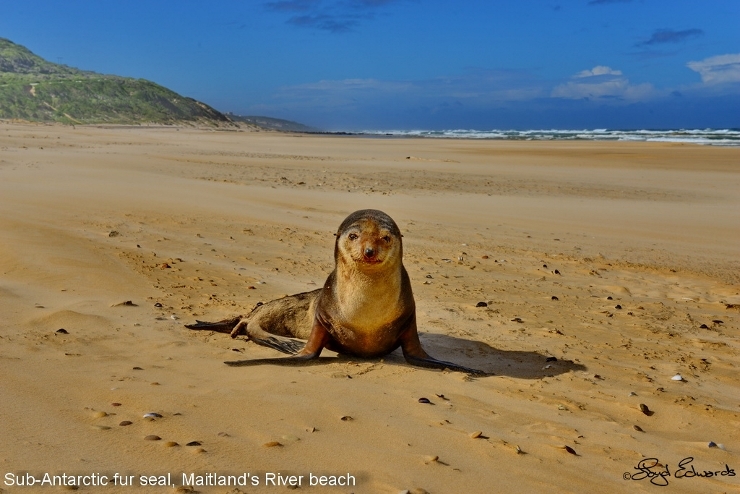 Of all species of seals they wander the most, and are frequently found along the coasts of South Africa, Australia, New Zealand and South America. They are widespread geographically. As their name implies they generally breed on islands north of the Antarctic convergence zone which is about 55 degrees South. The largest colonies are on Gough Island in the South Atlantic and Amsterdam Island in the Southern Indian Ocean. Closer to home they breed on Marion Island which is about 2000 km South of Port Elizabeth. 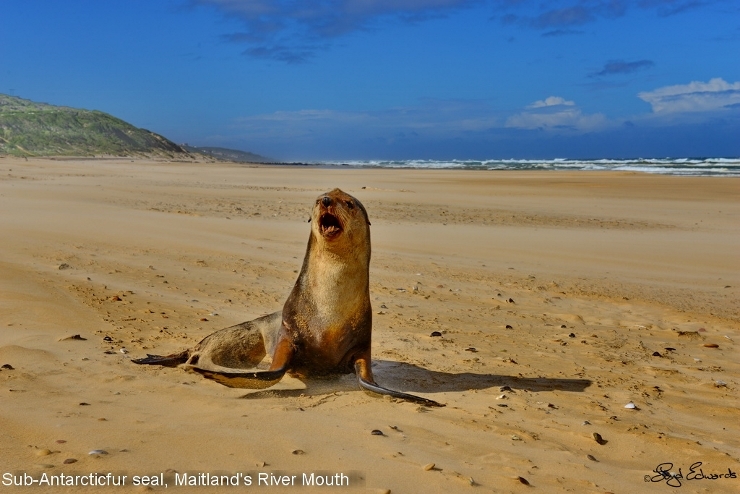 These seals can be distinguished from the Antarctic fur seals and our own Cape fur seal by the white to orange colour of the chest. They also have a "fringe" on the forehead. They are medium sized compared with other fur seals. Males grow to two metres and 160kg whereas females are substantially smaller, 1.4 metres and 50 kg. They live for about 20 to 25 years. This seal is still being spotted in the same spot so we hope he makes a full recovery and goes on his way but will soon have to send Dr Greg Hofmeyr from Bayworld for a better inspection, if not.